Google Analytics is every SEO’s best friend. Whether you’re a marketing manager or a consultant, it’s important that you measure the impact your marketing efforts are having on your website’s performance. Not only is Google Analytics important for measuring the performance of your marketing campaign, but it can also be used as a tool to look for good opportunities. Below are 5 analytics tips that every internet marketer should know about. When you log into your Google Analytics account, you’re going to see website statistics for all traffic. What many don’t know is that you can filter your entire account to look at a specific traffic source. At the top where it says “All Sessions,” click on that. 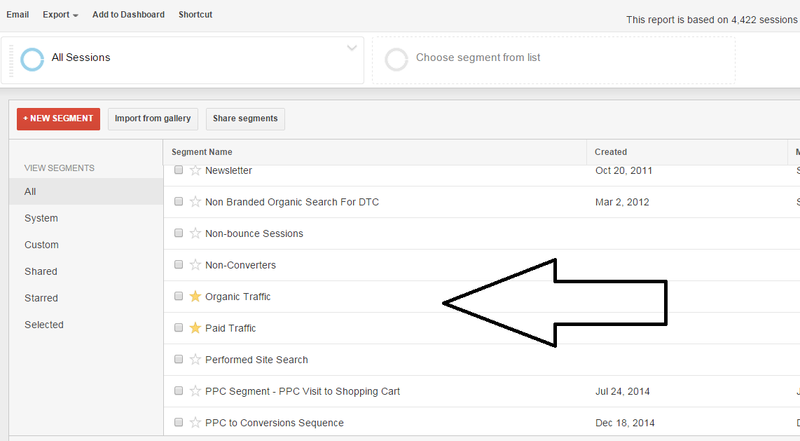 A drop down will appear where you can filter the entire account to only show data for the organic channel or paid search channel. Both have little stars next to them so that you can’t miss them. This way, when you’re looking at a report, you know that you’re only looking at data from a specific channel. Dashboards are an awesome way to get a quick overview of how your campaign is doing without having to look in multiple places. It’s important to include metrics and KPIs that matter most to your business in these dashboards. For an analytics for SEO dashboard, I would look at organic traffic, organic conversions/revenue, top landing pages, and average time on site as a few metrics to start. You can check out some already built dashboards here. As marketers, we’re always striving to learn more about our customers. Most don’t know that Google already collects demographics data from the users on our site. We can see information regarding age, gender, location, interests and much more by adding a couple of lines of code to your existing Google Analytics code. Simply click on the demographics tab and follow the instructions. Did you know that you own a great source of data and Google just reports on it? It’s called internal site search and you can see all search queries that a user performs on your site. You can use this data to improve the user’s experience on your site. For example, say you sell sunglasses and on the homepage you have links for most styles of sunglasses. However, you notice that there is a sharp increase in internal site searches for a specific style of sunglasses, say aviators. If lots of customers are searching for it, you might want to give that aviators page more visibility on the homepage, making it easier for customers to find the product they’re looking for. When looking at conversions and revenue numbers, most of us tend to look at just channel specific numbers. But to paint the full picture, you really need to look at all conversions, including assisted conversions. Assisted conversions occur when a user comes to the site through a channel (such as organic) and then leaves and converts later after coming through another channel (such as PPC). For example, if someone comes to your site from a search engine first, then bookmarks it and comes back a second time from the bookmark, they’d be recorded as a direct visit. Any purchases would be counted towards the direct channel, when they really found your site first via a search engine. The conversion would go to the direct channel and the organic channel would get the assisted conversion. Following these five Google Analytics tips will help you capture more data efficiently. If you have any analytics tips not included here, please share them in the comments below. Previous Previous post: The Great Length Debate: How Long Should A Blog Post Be?